Burano, with its brightly colored houses and businesses, is part of Venice but much removed from the crowds of St. Mark’s Square and the Rialto Bridge over the Grand Canal. It only takes a short water taxi ride across the Venetian Lagoon to get to this magical island with its gift shops, restaurants and narrow canals. Colorful houses and businesses line the canals. Historians believe the island was probably settled by the Romans in the 6th century. Most agree the houses were painted brilliant colors so fishermen could see their homes when they were far out to sea or to find them when they’d had a little too much to drink. Photographing the colorful houses is so enjoyable on Burano Island. From the Burano dock I wander past several open-air booths selling traditional souvenirs. Along a narrow alleyway I come to a shop specializing in lacework. Burano is famous for its needle lace and a woman sits in the center of the shop surrounded by elegant lace tablecloths, lace-trimmed linens and other finery. 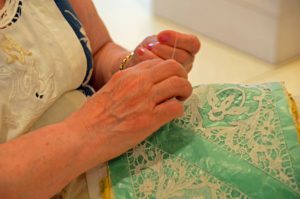 She meticulously creates another piece of lace artwork. Handmade lace is labor intensive and very expensive. La Perla Gallery is a good place to purchase Burano lace. A woman makes Burano needle lace in a lace shop. After watching the lace maker for several minutes and admiring her talent, I head out along the canals and into neighborhoods to photograph the pink, red, blue, plum, yellow, peach and golden houses; many trimmed in contrasting colors with flower boxes filled to overflowing flowers. 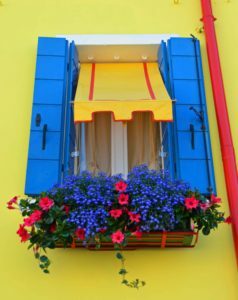 Flower boxes add to the beauty of Burano Island. I wandered along other boardwalks next to canals and stopped for gelato before heading back to the dock to take the water taxi back to Venice and my hotel. 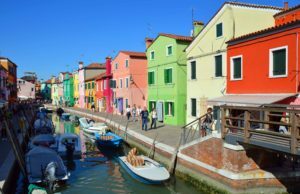 Many Venice visitors make their way to Murano to see the famous glass being made, but try to also make time for Burano; a treasure of color and lace. If you are traveling throughout Italy or Europe, check out the Eurail passes. They provide a convenient and economical way to travel from city to city including Venice. We never got to visit Burano when we were in Venice but I would love to next time. The colors are so beautiful. I had such a relaxing time shopping and exploring; my kind of day!! Your photo’s once again are amazing. The colors of the buildings and flowers and the intricacies of the lace are captured perfectly. I have never really wanted to travel anywhere but the U.S. but perhaps one dayi will visit here. Thank you so much Audre; I really appreciate your kind words!! You would love Venice and Burano Island. Get Daryl to take you there! Marilyn, I’d never heard of Burano. What a beautiful island. The colors of the houses remind me of our visit to La Boca in Argentina. A friend of mine told me about Burano; I had never heard of it either! I really enjoyed my time there. You did more than I did; I’d love to go back!! Yes, I loved Burano, even more than Murano! Such beautiful colors, and it was much quieter, which was a nice break from the crowds of the city. I didn’t make it to Murano; maybe next visit. I was pleasantly surprised by Burano though. I would go back! 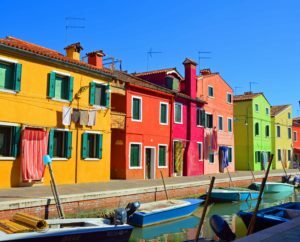 Love the colours on Burano – I haven’t been there, just Venice and the Lido, but maybe next visit this island deserves a visit. Even if just to get away from the crowds! It does make a lovely break in the day. As one of my friends said; it’s sure cheerful there! I will add lovely Burano to my Venice to-do list. 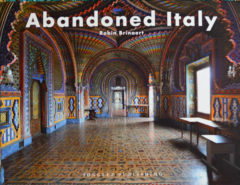 I visited the cemetery island on a long-ago trip and heard about the island where they make all the glass items (I guess it isn’t Burano, as I first thought). So much to see, so little time! There is so much to see!! The glass island you are thinking of is Murano. You take the same water taxi to both islands. I was in Burano many years ago and found it lovely. I like the idea that people painted their houses different colours so that they could find their way home after drinking! It is a funny reason to paint your house a different color; that’s for sure!! Whatever the reason, Burano is a beautiful destination! I kick myself that I never went to Burano when I was in Venice. Guess I’ll have to go back! What a lovely place. The colourful houses are beautiful. I didn’t to get to Murano, so I guess I’ll have to go back too!! 🙂 There is so much to see in Venice! I adore the colours in your photos, Marilyn! I’ve not yet been to Venice, but would love to go! It was my first visit to Venice. 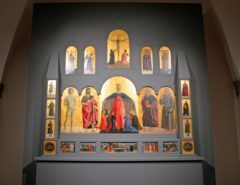 I am already wanting to return to Italy!! 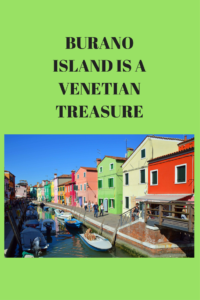 I’d love to get to Venice and include both Murano and Burano in my itinerary! So lovely! I am sure I would come home with a sample of the lace. Did you? The lace is beautiful and very expensive!! So no Burano lace for me. 🙁 I want to go to Murano too, but I am glad I did get to Burano. It was a fun day! We were in Burano and Murano during the winter, it was great for lack of crowds but there weren’t any needleworkers. I guess there are different advantages and disadvantages to traveling in different seasons. The lace maker was in a very high-end shop. No photos allowed, but the manager did agree to let me photograph the woman making lace. I hope to get to Murano on my next trip to Venice. There is never enough time!! 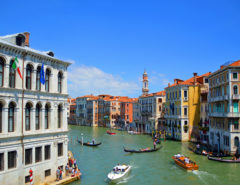 Venice is definitely on our must-see list and Burano with all its bright colors and beautiful lace. Thanks for the recommendation! I had never heard of Burano until a friend told me. I was very impressed! Thank you! Burano is so beautiful and unusual! I appreciate you kind comment! !